Skydiving Santa’s, a Christmas skydiving themed event hosted at the Cocoa Beach Pier has partnered this year with Toys For Tots to give back this holiday season. Previously known as a skydiving and surfing event, Skydiving Santa’s has now become a separate event from Surfing Santa’s due to it’s vast popularity. 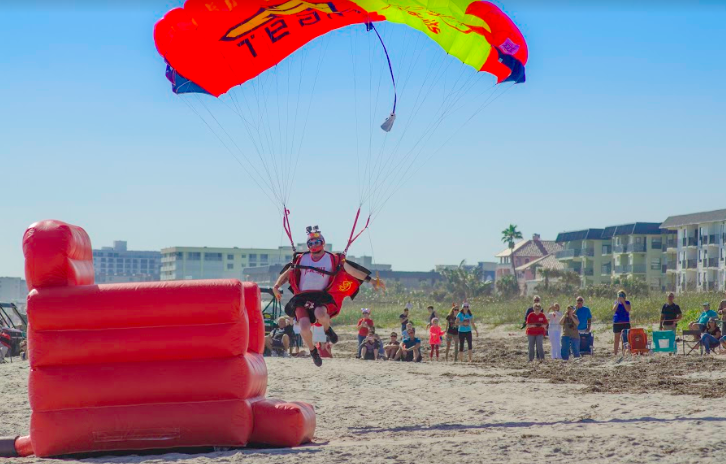 Now, every December, hundreds of locals and visitors swarm the Cocoa Beach Pier area to watch 100 dressed up Santa’s from the Air Sports Parachute Team entertain the crowd by skydiving right onto the beach. The Skydiving Santa’s event will be held on Saturday, December 15th from 11 a.m. to 4 p.m. at The Cocoa Beach Pier. Every 30 to 40 minutes you can watch as a Santa will jump to reach a specific target along the Cocoa Beach Pier’s shoreline. This year, Skydiving Santa’s is working alongside Toys for Tots to ensure each less fortunate child receives a gift this Christmas. To make a donation to Toys for Tots visit: mims-fl.toysfortots.org. About The Cocoa Beach Pier. About I Love Cocoa Beach. I love Cocoa Beach is the one stop shop to discovering all that Cocoa Beach has to offer. Through I love Cocoa Beach you can keep up-to-date with deals happening at your local favorites and become the first to hear about events near you. Our dream is to bring our community even closer together by building an online presence that connect those who love Cocoa Beach instantly.